This last week has been a delightful unplugging for me, off exploring Colorado via its craft beers and its snow-covered mountains with a good friend in from out of town (he’s a Red Sox fan but I overlook that). 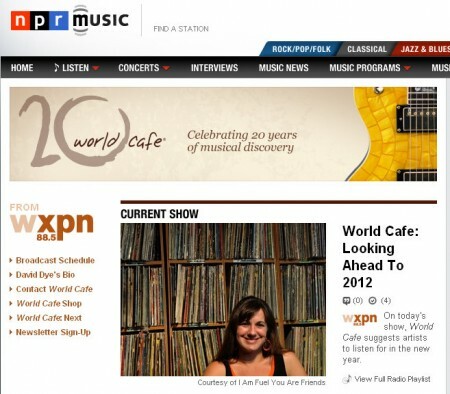 On Friday, we caught my NPR’s World Cafe with David Dye interview segment, and in case you missed it or live somewhere that you can’t stream it, I’ve made an mp3 for ease. Here I am talking about some of my favorite picks from 2011 with the always-wonderful David Dye — I love doing this because I’ve found I really like playing DJ. And cracking lame 30 Rock jokes. This is so awesome! You’re great on the radio. Just as great as on the blog. Thanks for sharing this! NPR, Master’s Program… the Browne train keeps a’rolling. I finally got a chance to listen to this. Good work and nice picks.